What Are Customers Saying About Junk King Birmingham? Before the Internet, customers could voice their opinions about a company by making a phone call directly to them for sending a letter. That meant that any reviews were private. Today, everyone can share their opinion in a variety of ways. Companies are well served to provide outlets for their customers to post comments. Not only does that help them improve their business but it also lets potential customers know what’s going on. 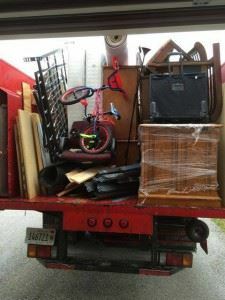 When it comes to junk hauling, one look at the reviews left by Junk King Birmingham customers will make it clear this is the company to call on for all kinds of junk hauling chores. Junk King Birmingham knows how valuable your time is and they don’t want to waste it. The effort that you would put into hauling your own junk could take up most of your day off. Instead, junk King gets in and out with very little fuss. You’ll wonder why you waited so long to make the appointment! As with most service companies, Junk King is at the mercy of traffic. That’s why they build in a kind of buffer between appointments. They want to make sure they have plenty of time to get from one location to the next. The crews will always let you know what their status is throughout the day until your job is complete. It’s part of their approach to junk removal. Junk King’s pricing policies are always based on volume and not weight. You never be charge by the pound with Junk King. And that can make a huge difference with what you want to get rid of. In other words, anything goes regardless of weight. What more could you want from a professional junk hauling company? Do you have things you want to get rid of around the house or yard? Then Junk King Birmingham is the only call to make. This entry was posted in Birmingham Junk Removal and tagged Junk King, junk removal, reviews on September 25, 2017 by Junk King. Last updated September 25, 2017 .